Serviceability Report: Honda CR-V - AutoInc. Which model year is easier to service: the 2011 or the 2016? I started my career as a motorcycle mechanic in the late 1960s. The local Honda shop needed a helper. After a day, I was hooked. I worked for peanuts and loved every day at Sportsman’s Cycle Sales in Holden, Mass. Today, I still drive a vintage 1975 Honda CB400f and the Insight, my first hybrid. As I reflect on the company Honda and the man, Soichiro Honda, they have been a big part of my career. Honda was there at the right time for me. But let us look forward. Motor vehicles are changing in many ways and being a part of those changes, trying to keep up with progress, is both exciting and challenging. How do today’s technicians do it? Those who don’t respect technicians don’t understand what they do. The Internet is a big help, as are the technical schools and companies such as Identifix. The resources at the touch of a button are vast. It’s important to know as much as you can so that the free online information can be sifted through for the golden nuggets. This month, we look at the evolution of the Honda CR-V through the eyes of a tech. Is this little SUV getting easier to service, or did the engineers forget about us? Full disclosure: Honda Research & Development and Honda Manufacturing are Automotive Career Development Center (ACDC) customers, and as I stated above, I have had a love affair with Honda for almost 50 years. But I won’t let that keep me from reporting the truth as I see it. The Honda CR-V is the company’s small SUV, loosely derived from the Honda Civic. Some people think that CR-V stands for “compact recreational vehicle.” Sounds good to me. The CR-V is Honda’s second-smallest utility vehicle, slotting between the smaller HR-V and the larger Pilot. 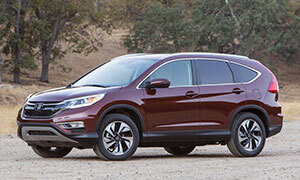 Sales have always been good, and many Honda techs I talked with like the CR-V. The first generation of the CR-V was sold here as a model year (M/Y) 1997, and it pretty much stayed the same. The second generation was M/Y 2002 to 2006, and the third generation was sold from M/Y 2007 to 2011. Honda began producing the CR-V in East Liberty, Ohio, in 2007. The CR-V continued to satisfy its owners, and sales grew. The last big update was M/Y 2012. It’s basically the same in 2016. People love the Honda CR-V. They like the power, although some always want more power. There is no V6 engine option. Under the hood of the CR-V is an in-line, four-cylinder internal combustion engine (ICE) displacing 2.4 liters. Horsepower is 180 @ 6800 rpm and the torque number is 161 pound feet @ 4400 rpm. This was the first generation of CR-V to use a timing chain (the timing belt was eliminated in M/Y 2001). The handling is controlled and firm. The only available transmission is automatic, and both front- and all-wheel drive are available. Fuel economy, at 21city/28 highway with front-wheel drive, is respectable for the class, while AWD models average just slightly less. Recall No. 11V395000 concerns model years 2007-2010 CR-Vs manufactured from July 1, 2004, through Sept. 3, 2010. The outer race of the secondary shaft bearing may break during certain driving styles. A broken outer race may cause abnormal noise, the malfunction indicator light to turn on and allow contact between the transmission idle gear and an electronic sensor housing within the transmission. One more recall, No. 11V004000, is a potential failure with the engine wiring harness connector, which may cause intermittent spark plug firing and the engine to stall. Overall, this generation has been very reliable. All years, if AWD, require four tires that are exactly the same. Even a set of worn tires on one end and new tires on the other can cause problems. Iridium spark plugs are a must and a proper positive crankcase ventilation (PCV) valve will keep the carbon monoxide (CO) levels down. Every part you replace must be of good quality. Honda has just partnered with Drew Technologies, and now a factory scan tool is under $500. Supply a laptop and get a one-day-or-more subscription, and you’re ready for any 1996 or newer Honda. Don’t get rid of the old Mastertech scan tool because it still helps on many older models. Hondas sell well, and the owners are trained to do their 30K, 60K and 90K-mile checkups. Make a Honda owner happy, and they will be loyal. The overall product is good. There have been three recalls, but all were easy to fix. The first recall, No. 13V143000, had to do with the shift interlock. Good idea to make sure your customer has had it done because it may not stay in Park. The second recall was done for a label missing concerning the tire pressure on fewer than 300 units. Recall No. 12V338000 concerns the M/Y 2012. Honda is recalling most of that year because of the front door handle. When operated by a passenger, the cable connecting the interior door handle to the door latch mechanism may work loose and shift. There’s a possibility that the cable can move far enough out of position to prevent the door from properly latching. In an accident, the door can pop open. Three recalls, with two that really matter? Not bad for a big redesign. Pricing for the 2016 CR-V starts at $23,595 for a front-wheel-drive LX, $150 more than last year’s model. Like all CR-Vs, the LX is fitted with a 185-hp, 2.4-liter, four-cylinder engine and 181 pound-foot of torque. If you want all-wheel-drive, it will cost you $1,300 more. In M/Y 2015, the CR-V made a major change by going to a continuously variable transmission (CVT) that’s now standard. The CVT has had problems in the past with dirt entering the transmission when you’re checking the fluid or replacing the CVT oil. The belt and pulley system required extreme pressures to operate, and any small gritty particle (sand) can score the pulley surface and create a slipping belt. In no time, the CVT belt can overheat and snap. It finds neutral very quickly this way. The Honda Insight and Civic hybrid have a CVT that was problematic. Get the owner to trust that only you will service his CVT. I have to say, the aftermarket (and I’m sure some dealerships), rush to change the CVT fluid and are not clean enough to keep the dirt out. Be careful here. Also in M/Y 2015, Honda switched to gasoline direct injection (DGI). The reason for this, of course, is better fuel economy. How much better? The 2014 model was 23 city, 31 highway and 26 combined. The same model in 2015: 27 city, 34 highway and 29 combined. A big improvement. Take off one mile per gallon for the all-wheel drive (AWD). The CVT and the new engine both played a big part. Preventive maintenance is important in both systems, so make sure your customers with the newer CR-Vs know what maintenance is required. I stopped by my old place of employment, Lundgren Honda, and spoke to Russell Houle. He has been a Honda salesman there for a long time. He agreed that the CR-V is a great product and introduced me to the new guard, as it was 1972 to 1974 when I wrenched for them. The younger techs love the CR-V and had little to complain about. The new CR-V is a bit easier to service, but the older model was easy to begin with. Use factory fluids or known good brands. When I studied the preventive maintenance charts, it looked as if Honda has one glaring misconception: “Inspect engine valve clearance audibly.” What does that imply? When the valve clearance is too loose, it will make noise. What kind of noise do “tight valves” make? Do your customers a favor and remove the valve cover every 60,000 miles, get out your feeler gauges and check the clearance. Many cars have a lot less maintenance listed in the owner’s manual these days. That may work in some situations but not in the Northeast where I live and ran my shop for 26 years. In California, there are laws concerning a shop advising car owners that “you need more maintenance” than the OEM suggests. I think an experienced tech can offer advice based on their knowledge and experience. Most trusting and financially stable customers will take it. Doing more than “required to keep the warranty in effect” is not a bad thing. This CR-V will last a long time if the tech and owner see eye-to-eye. If all motor vehicles were as well designed as this, a technician’s work life would be a lot better. As always, we can hope that cars will get better for those that fix them.